London Fog Cake from Tessa Huff’s Layered cookbook. 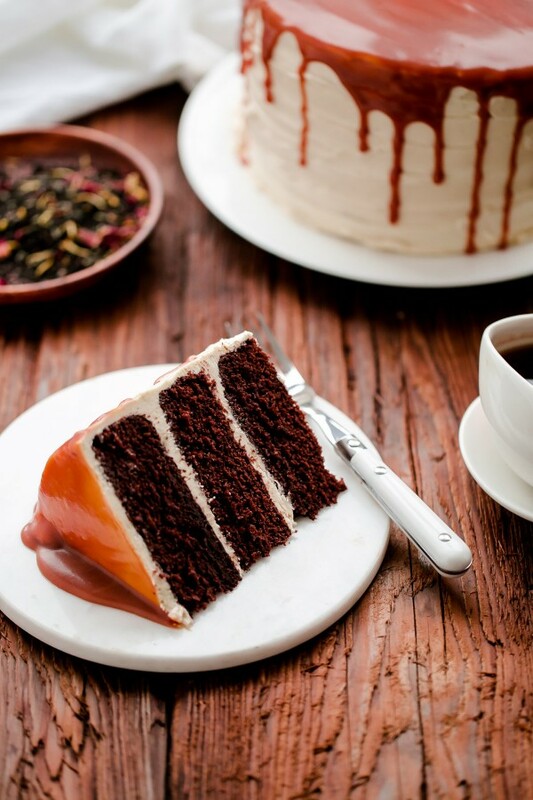 Moist, decadent chocolate layer cake filled with earl grey buttercream and topped with homemade salted caramel! I know I use this word a lot, but I’m in love with this cake. Both the cake and its name. London fog cake. So dreamy and romantic, right? This cake unequivocally lives up to each of those standards. In fact, I was so in love with this cake that I didn’t trust myself around it at all. I had to give most of it away to friends. Otherwise, I might have slowly consumed the entire thing by myself. The words ‘everything in moderation’ and ‘three layer 8-inch chocolate cake’ aren’t mutually compatible in a household of two, as much as I would like to pretend that they are. So, here’s the deal. I can’t take credit for this cake. I mean, I happily baked, photographed, and ate it, but that’s about it. The recipe is from my friend Tessa Huff’s incredibly impressive new cookbook, Layered, which comes out tomorrow! Tessa is the former bakery owner, talented baker, and writer behind Sweet Style CA, a blog dedicated to cakes and pastries. She makes some of the prettiest, most impressive cakes on the internets (you’ve probably come across a link to her blog in The Sunday Thymes!). I’ve admired her work for a long time! Layered, is all about baking, building, and styling spectacular cakes from start to finish. Everything from two layer cakes to six layer cakes, and everything in between. It is perfect for beginners looking to get their feet wet, as well as more experienced bakers. So, I was incredibly honored and excited when Tessa reached out and asked if I would be interested in sharing a recipe from the book with you guys! Excited and slightly nervous. Excited, because it meant that I finally had an excuse to bake that fancy layer cake that I’ve been dying to make. Nervous, well, because she sets a high bar and I don’t really consider myself an experienced cake decorator by any means. It’s not the baking that intimidates me, it’s the assembly. I can decorate as many cupcakes as you put in front of me, but layer cakes? Smooth sides, leveling, and super even layers?! Hi, I’m scared. 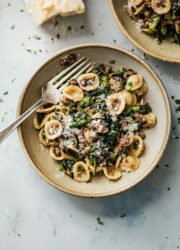 Thankfully, Tessa removes all anxiety and intimidation from the equation with her incredible step-by-step instructions and photos, as well as comprehensive recipes and tips. 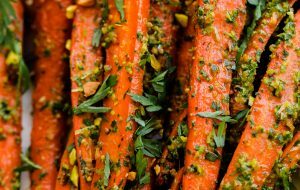 The recipes are detailed and thorough, and incredibly easy to follow! I can’t tell you how excited I am to bake more cakes from this book. The cookbook itself has more than 150 recipes! 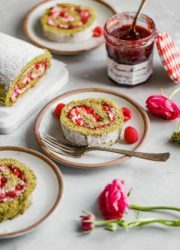 There is everything from classics to cakes infused with riesling or pink peppercorns, and the book inspires you to mix and match various frostings and cake recipes together to make your own masterpiece. Today’s London Fog Cake with Earl Grey Buttercream stood out immediately, and I knew I had to make it! For starters, I love, love, love tea (my English roots) – particularly earl grey – so the flavors were immediately up my alley. If you’re not familiar with the drink, a London Fog is basically a tea latte. Strangely enough, I’d never had one before I made this cake! 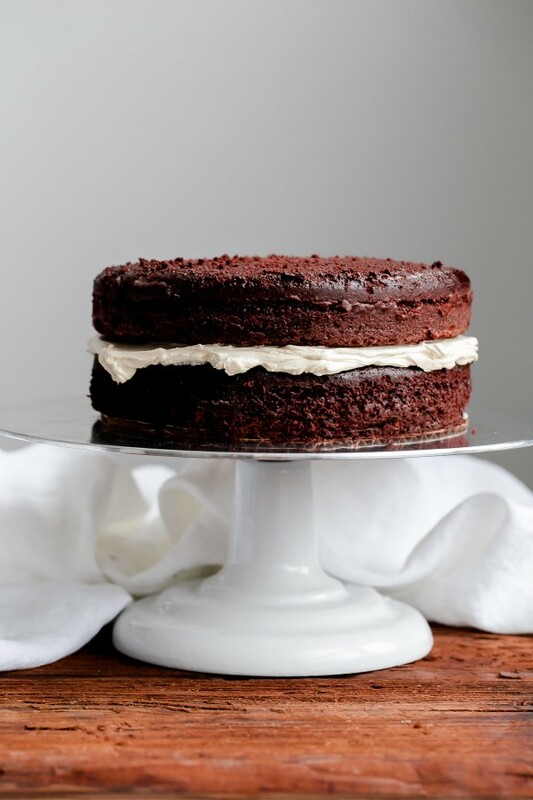 This London fog cake consists of three-layers of chocolate cake (the batter uses both freshly brewed coffee and oil, which keeps it extra moist!). 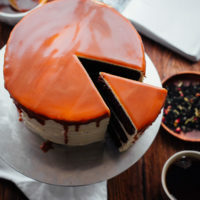 It is then filled with an earl grey infused swiss meringue buttercream (YES), and finally topped with a generous layer of homemade salted caramel. See those little specks in the frosting below? You also put some vanilla bean paste in the buttercream. It’s basically a dream come true. This cake truly blew me away! As I’ve told you guys on multiple occasions, I’m way more of a fruit dessert person (crisps, pies, etc.) than a cake person – so the fact that I could not stop eating this cake says a lot. The earl grey buttercream had a very distinct, yet not at all overpowering flavor – and the salted caramel took it over the top. I can’t wait to make it again. It also stored incredibly well. I actually baked the cake layers two days before I assembled it, and the cake still tasted great four or five days later. If you are intimidated by layer cakes (I promise, it’s not as complicated as it appears! ), I highly recommend preparing this cake in stages. You can make and prepare the salted caramel days (or up to 2 weeks!) in advance, and the cake layers can be baked ahead of time as well. Just remember to allow the cakes to cool completely and then individually double-wrap them in plastic wrap for storing in the fridge (you could also freeze and defrost them). I highly, highly recommend picking up a copy of Tessa’s cookbook, especially if you’ve wanted to improve your cake decorating or baking skills! It is such a wealth of information – and beautifully organized – and truly one of the most comprehensive cake baking cookbooks I’ve ever come across. Here’s to many more cake baking adventures in the future! London Fog Cake from Tessa Huff’s Layered cookbook. A moist, decadent chocolate layer cake filled with a earl grey Swiss Meringue buttercream and topped with homemade salted caramel! This stunning cake is perfect for special occasions! Preheat the oven to 350 F (175 C). Grease and flour three 8-inch (20-cm) cake pans and set aside (*see the note section for tips if you do not own three pans). Sift together the flour, cocoa powder, baking powder, baking soda, and salt and set aside . In a bowl of a stand mixer fitted with a paddle attachment, beat together the oil and sugar on medium speed for 2 minutes. With the mixer on, add the eggs, egg yolk, vanilla, and almond extract. Stop the mixer and scrape down the bowl. Turn the mixer to low and add the flour mixture in three batches, alternating with the milk, beginning and ending with the flour mixture. Stop the mixer and scrape down the bowl. With the mixer on low, stream in the coffee. Mix on medium-low for no more than 3o seconds, or until combined. Evenly divide the batter (*see my own notes for tips to do this!) among the prepared pans. Bake for 23 to 25 minutes, or until a toothpick inserted into the center of the cake comes out clean. Let them cool on a wire rack for 10 to 15 minutes before removing the cakes from their pans. Allow to cool completely. 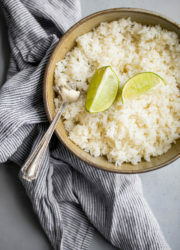 Place the sugar, corn syrup, and 2 tablespoons water in a heavy-bottomed small or medium saucepan. Stir to combine. Heat over high heat, occasionally swirling the pan, until it turns a medium golden amber color, 8 to 10 minutes. The sugar mixture will begin to rapidly boil before slowing down and darkening in color. Remove the saucepan from the heat once the correct color is reached and the bubbles start to subside. Slowly and very carefully whisk in the room temperature cream. The mixture will foam up and sputter, so stand clear and keep stirring. Add the butter and continue to stir until melted. Add the salt and vanilla and stir to combine. Pour the caramel into a heat-safe container and let it cool until it reaches the desired consistency or refrigerate it until ready to use. It will thicken as it cools. 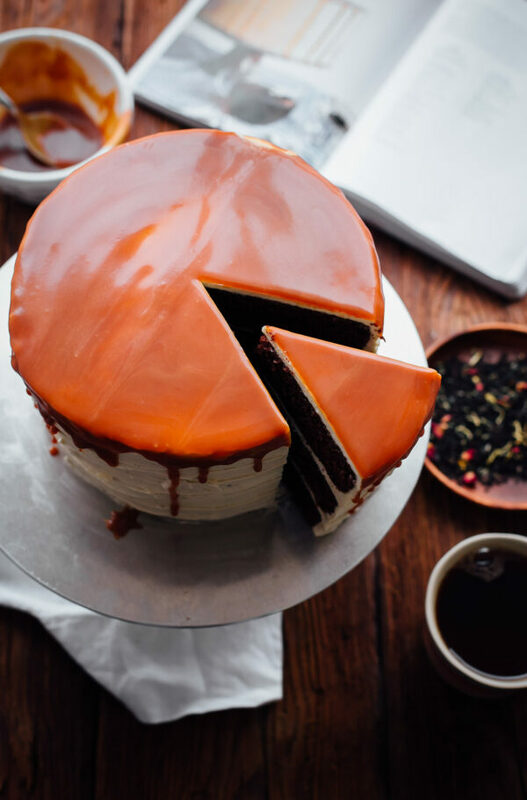 The caramel should be room temperature for cake assembly, but any leftover caramel can be stored in an air-tight glass jar in the refrigerator for up t0 10 days. 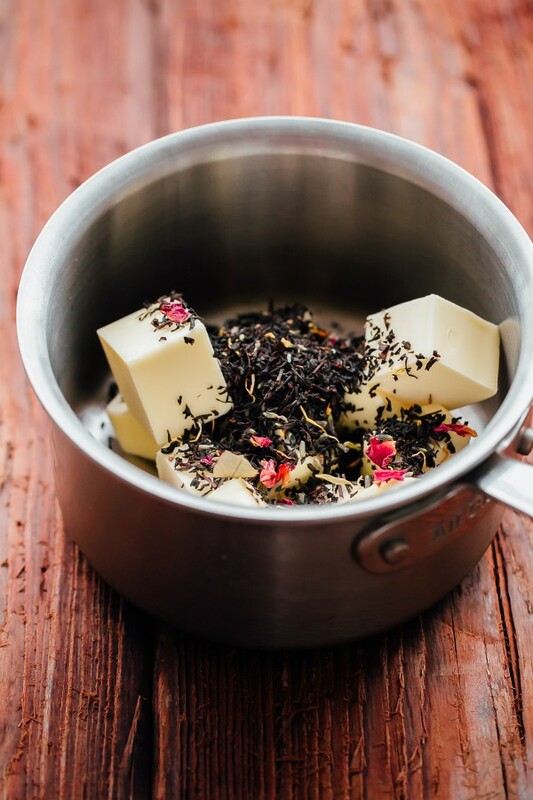 Place 1 cup (2 sticks/225 grams) of the butter in a saucepan with the loose tea. Heat over medium heat until the butter melts, then reduce the heat to low and simmer for 5 minutes. Remove from the heat and let the tea steep for 5 minutes more. Strain the butter through a fine-meshed sieve set over a bowl and refrigerate it until it reaches the same consistency as softened butter, 20 to 30 minutes. Small bits of tea may remain in the butter. Place the egg whites and sugar in the bowl of a stand mixer. Whisk them together by hand to combine. Fill a medium saucepan with a few inches of water and place it over medium-high heat. Place the mixer bowl on top of the saucepan to create a double boiler. The bottom of the bowl should not touch the water. Whisking intermittently, heat the egg mixture until it reaches 160 F (70 C) on a candy thermometer or is hot to the touch. Carefully fit the mixer bowl onto the stand mixer. With the whisk attachment, beat the egg white mixture on high speed for 8 to 10 minutes, until it holds medium stiff peaks. When done, the outside of the mixer bowl should return to room temperature and no residual heat should be escaping from the meringue out of the top of the bowl. Stop the mixer and swap out the whisk attachment for the paddle. With the mixer on low speed, add the vanilla, tea infused butter, and remaining 1 cup (225 grams) butter, a couple tablespoons at a time. Once incorporated, turn the mixer to medium high and beat until the buttercream is silky smooth, 3 to 5 minutes. Once the cakes have completely cooled, level them and choose which layer will be the bottom (tip: pick the sturdiest layer). Place it on a cake plate, turning table, or serving dish. 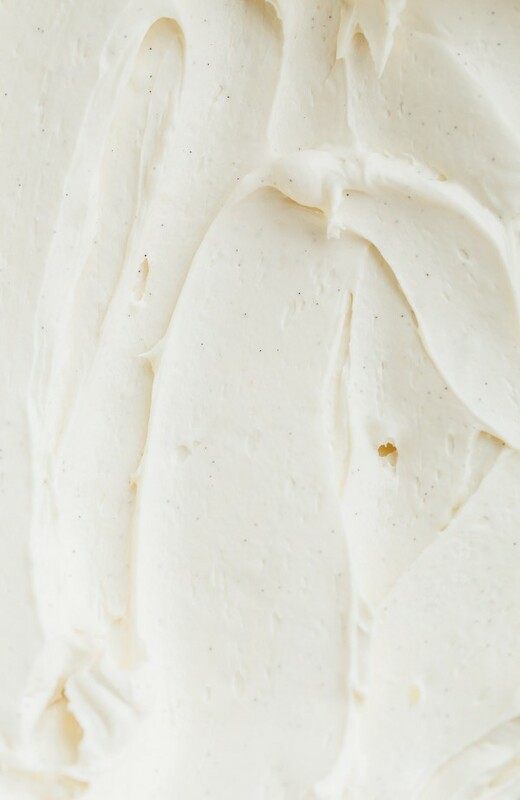 Spread on 1/2 cup (120 ml) of the buttercream with an offset spatula. Top with the next layer of cake and repeat, ending with the third layer (tip: pick a level, attractive layer for the top). Frost the cake with the remaining buttercream and refrigerate it until set, 15 to 20 minutes. Pour the caramel onto the top of the cake, letting it drip over the edges. Begin by adding 1/2 cup (120 ml) of caramel to the center of the cake and then smooth it out with an offset spatula. Add more caramel as necessary until desired look is achieved. The cake will keep in the fridge for up to 4 days; it may also be frozen. Store any remaining caramel sauce separately in the fridge for up to 2 weeks. 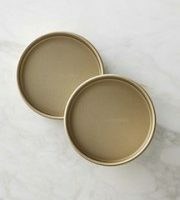 If you do not own three cake pan (I only own two), you can bake two layers at a time – and finish with one final layer. The batter will hold. Wash and cool the cake pan before using again with the remaining batter. 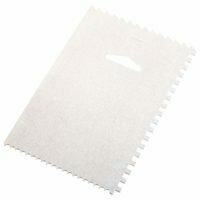 To make very even, flat cake layers, I like to use these cake strips, which prevent most doming . I also recommend weighing your empty stand mixer bowl in grams before you start baking this cake. Note the weight on a piece of paper. Weigh the final, prepared cake batter (in the bowl) and subtract the weight of the empty stand mixer bowel. This is the total batter weight. Divide this number by three. This final number is the weight of batter you want in each cake pan before it goes into the oven. Reprinted with permission from Layered: Baking, Building, and Styling Spectacular Cakes by Tessa Huff. Oh my gosh, Laura, this cake is absolutely beautiful! Can’t wait to get my hands on this book! Question: where did you get your cake stand?! I love it! Thanks so much Lucia!!! It’s this Ateca revolving cake stand – great for decorating, but also looks really nice for serving too. Turntables are sort of a game-changer for cake decorating, it really makes all the difference. Thank you so, so much Mary! I swear, I’ve made very few layered cakes in my life, so that means a lot. A decorating turntable and cheap cake comb (the cake stand shown in the pictures) makes a world of difference. Do you mean the whites for the frosting? If so, I would start over! I’m sorry, but the cake will definitely not turn out properly with that amount of extra liquid/protein. There’s really no hack that you can do to fix that after it’s been done! Sorry for the bad news. Hope you still try the cake, it’s amazing!!! A cup of early grey and a cookie is my favorite afternoon snack. I bet this cake tastes as amazing as it looks! Beautiful Photos! Thank you so much!!! You would LOVE this cake! If you don’t make the entire thing, at least try the buttercream. Incredible! Oh my gosh, Laura! These pictures (and that cake!) are so gorgeous. I preordered the book a couple weeks ago…I am so NOT a cake decorator, but I can’t wait to dive into it to learn some new tricks. Your version of this cake makes me all that much more excited! Oh yes!!! You will love it! I’m not a cake decorator either (seriously). Turntables and the right equipment make a world of difference – and having the patience to allow the cake layers to firm up in the fridge before you assemble. Your cake looks absolutely perfect! I love the way you frosted the outside. I love baking cakes so this cookbook is definitely on my to-purchase-list. Thank you so much Erica!! You would love the book! Laura, this cake is way incredible. The London Fog is one of my all time favorite drinks! 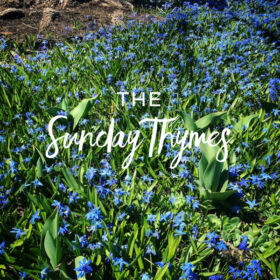 Beautiful photography and Tessa’s book sounds like a surefire way to spend many happy weekends. Thank you so much Danielle! It’s an amazing book – such a great resource for cake baking and decorating. This is insanely gorgeous! And absolutely perfect – I can never seem to get my layer cakes quite that even. 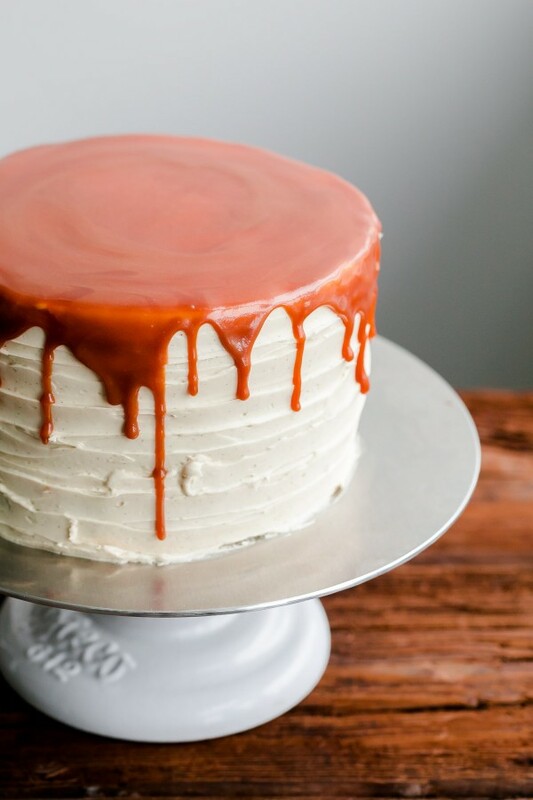 And that caramel drizzle… <3 <3 I don't blame you for wanting it out of the house asap! This is so stunning! I have still never baked with any tea other than matcha. I need to get my hands on this book! Absolutely beautiful! Earl grey buttercream sounds amazing. Love the photos, as always. Thank you so much Annie!! That means so much. THE BUTTERCREAM WAS INCREDIBLE. Favorite part. It turned out so amazing! I just re-read every word =) You are so sweet and talented. I appreciate you!! Thank you for your time, talent, and kind words. Thank you so much Tessa! I was thrilled to share the book, and am so happy to have it. You fulfilled my wish to make a layer cake for no particular reason!!! You did an amazing job on the book and I can’t wait to bake from it again and again. Oh boy – this cake looks incredible – and incredibly complicated! However, it’s a gorgeous cake and I hope to muster up the energy to bake it one day! Thank you SO much Lyndsay! That means so much coming from you. I’ve admired and loved your blog (and cake creations!) for a long time now. You definitely have to make this cake! I love, love, loved it. The cake pan strips are GREAT!!! I know you can make your own, but I just found it easier to buy them and I find that they definitely decrease doming. This is insanely fantastic! All of those flavors in one treat! Must be dreaming! Making this come true as it’s going straight to the top of the must bake list! Thank you so, so much! Promise, it’s totally worth the effort. One of the best cakes I’ve ever had. 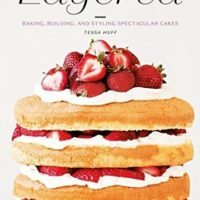 One of my favorite things to do in life is to bake (and eat) layer cakes, so I think I really need this cookbook! Also, totally adore this flavor combo. I would have never thought of it myself, but now I can’t get it out of my head! I will definitely be testing this soon! 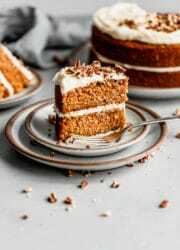 I notice that your Earl Grey loose leaf has flowers in them – knowing the lengths to which Earl Grey can go in combinations, what sort of blend do you think would go best with this cake? I have an Earl Grey with cardamom, but also an Earl Grey with Lavender, and access to an Earl Grey Shanghai (http://www.americantearoom.com/collections/black-tea/products/earl-grey-shanghai-yunnan-base-organic-tea). Which do you think would work best, if any of those? Hi Jaime! I think most to all Earl Grey combinations would work well for this – probably all of them? But the cardamom or lavender (I know my variety included some lavender) might be the best choices – just depends on what you’re in the mood for – if you already have those on hand! Hope this helps! I just got this book over the weekend and it’s absolutely stunning, just like this cake. This is almost to beautiful to eat.. I just made this cake and everyone loved it! I sprinkled some sea salt flakes on top just to finish it off. The cake was moist and the caramel flavor and texture was just perfect. I steeped the tea 2 mins longer coz I really like earl grey and it worked out well. I am now going to buy the book! Thank you for a beautiful and delicious cake. I would absolutely love to make this cake as it include all my favourite things but the one thing that is putting me off is that I hate coffee – can you taste it? Please say no or tell me it’s easy enough to take out without ruining the recipe? Wow, thank you SO much for this recipe, and for the clearest instructions! Made this for my husband’s birthday, who was very weary about sharing any of it, saying it was the best cake he has ever eaten. And my hobby is baking! So that’s saying a lot. I’m buying this book as I write this. Thank you again! I’m so thrilled to hear this Malina! I’m so happy that your husband liked it. I really did think it was one of the BEST cakes I’ve ever had too. Thank you for the feedback. The book is fabulous, I highly recommend grabbing a copy! I love this book! 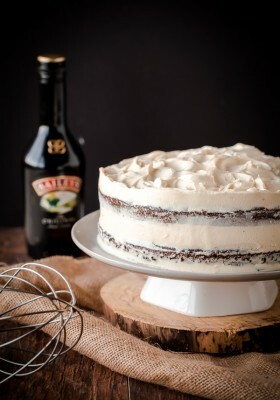 Can’t wait to make this cake! 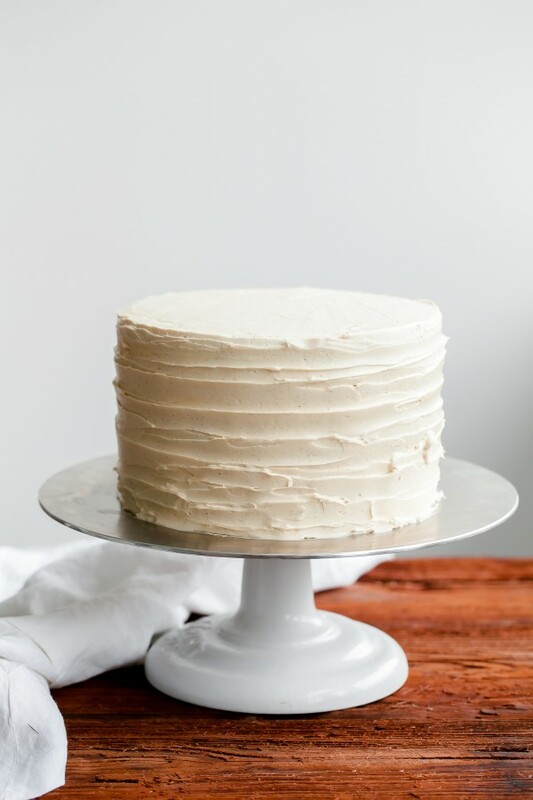 I also love this cake stand….Can you share “where to buy” details? I’m currently obsessed with cake stands!? I love it too – and I promise, you will LOVE this cake. The cake stand is actually a turning table too, which makes it great for decorating. It’s this Ateco one – a bit pricey, but totally worth it and very well made. The cake is amazingly moist. I think it’s the first from-scratch recipe I’ve used that has been just as – if not more – moist than packaged cakes. So glad you liked it! 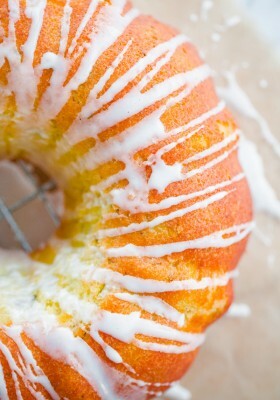 I totally agree – it is incredible moist due to the oil/coffee ingredients. Would it still work if you didn’t use the coffee in the cake?? You definitely need the coffee, otherwise the cake wouldn’t come out right. But I *think* you could substitute it with strong brewed tea too. I haven’t tested that to be certain. I promise you won’t taste the coffee!! The ravings in the previous comments are so well deserved! 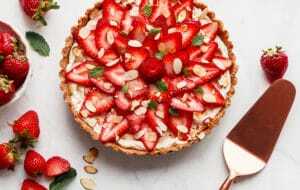 The photography, layout of the recipe and everything else included in this write-up are exceptional and I can just hardly wait to make this cake.It is just my husband and myself in the house , so I am thinking I have a problem when it comes to willpower. I am a fruit dessert lover, and also a cake lover, as well! Cannot resist, but often I freeze half the cake -even with frosting on (yes, it can be done, contrary to those who say it is best not to), I love to have it on hand for future use. Thank you so much!! This cake freezes exceptionally well (with frosting) – I allow it to chill in the fridge, then wrap it tightly in plastic wrap – two layers – and cover with foil. Just let it thaw in the fridge and a bit in room temperature before serving. The only slight problem is that the caramel tends to stick, so if you prefer to freeze and make another batch of caramel for later, that could also work well! Hope you like the cake Carol!! Made this cake for a friend’s birthday and it turned out a dream! So incredibly moist, and the chocolate and Early Grey flavours were perfectly balanced. Thanks a bunch Laura and Tess! So thrilled to hear that! It’s one of my most favorite cakes ever. I’m so glad you agree. I just made this cake for my first anniversary with my husband (decorated with fresh flowers) and it is truly the most delicious and gorgeous cake I have ever made! I decided to make 2 more cake layers and turn it into a 5 layer cake. Thank you so much for the recipe. I wish I could post a picture of the end product in these comments. Splitting the work up over a few days made it very manageable to create. In the process of making right now, and everything is tasting scrumptious – however, my buttercream is refusing to thicken up. It’s not separating or curdling, just consistently ends up in a cheesecake-filling consistency. Any clue where I may have gone wrong? Hi Rachel! I’m so glad you’re trying the cake – it’s one of my favorites. Is it very thin and not fluffy? It’s hard to know, but it sounds like either your butter is too warm or the meringue was not whipped properly? 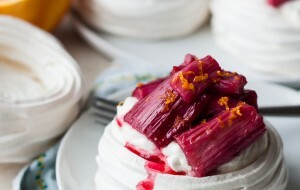 Swiss meringue can be finicky depending on the temperature of your kitchen. Maybe try popping a small amount of it in the fridge for 15 minutes and trip re-whipping? Not a huge fan of chocolate.. do you think I can just omit it? Any ideas of what would be good in replacement besides vanilla? Are those rose petals I see in your Earl Grey? What a gorgeous cake. I must bake it this w/end! Holy cow. The earl grey buttercream is TO DIE FOR. Cake is all assembled and I’ll get to taste it all together tonight. But each component is a 10/10. Thank you! So glad you enjoyed it! It’s probably my favorite cake of all time! Can I substitute buttermilk for the milk? Since I’ve never tested the cake with buttermilk, it’s impossible for me to say with full confidence that you can substitute it and get the same result. 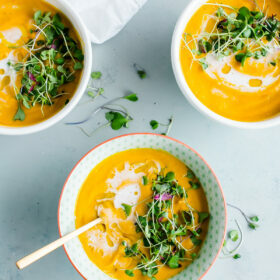 I would really recommend sticking with the original recipe ingredients for guaranteed success – I have a feeling you’d need to mess around with the baking soda/baking powder ratios because you need to account for the acid in the buttermilk that is not contributed with the original milk. I hope this helps and provides some insight!